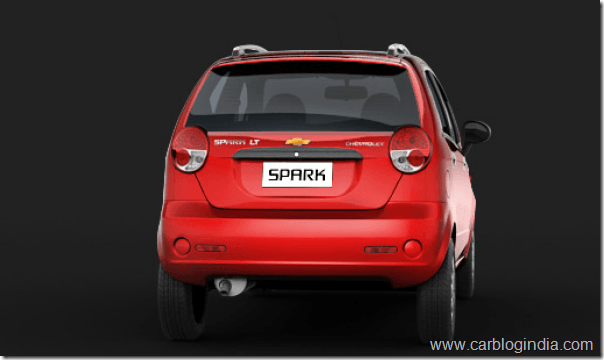 2012 Chevrolet Spark New Model Spied– Is This Spark 800 CC? Back in March 2012, at the launch of new Chevrolet Tavera Noe3 BS4 variant in India, we got a chance to interact with GM India President and MD, Lowell Paddock and VP of Corporate Affairs P Balendran regarding the roadmap of Chevrolet India in 2012 and the upcoming launches. As per the information shared by them, the major launches in this year include new Chevrolet Captiva, Chevrolet Sail hatchback and sedan, Chevrolet Enjoy MPV and updated Chevrolet Spark. 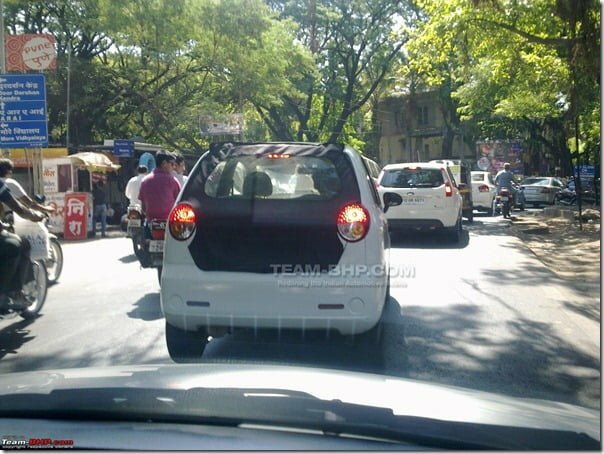 Recently a test mule of 2012 Chevrolet Spark with its boot door covered has been spotted testing on Pune Roads. There was not much of camouflage on it except for the rear being covered and there is only a rear shot of the car spotted by Adi_k from Team-BHP Forum. The Spark was introduced in India in the year 2005 with a 1 Litre petrol engine. Back in the year 2005, it used to be one of the most refined small cars in the segment with a smooth engine, compact exteriors and comfortable space for 4 adults. Spark has been quite popular with small car buyers for quite some time but gradually as the competition increased and more and more cars came in, the value for money factor of Spark started to go down as the competing products offered better fuel mileage, better interiors, features, improved design and exteriors. Its own sibling, the Chevrolet Beat did take away some of the charm of the Spark as it was way forward looking compared to the Spark. The 2012 Chevrolet Spark being tested seems to have minor cosmetic upgrades at the rear. The front of the car may also get some cosmetic upgrades for making it distinct from the ongoing Spark 2005 model. The new Spark may also be getting a new engine which maybe an 800 CC petrol unit which may bring it in line for the 800 CC segment which boasts of better mileage and affordable price points as we have the Alto STD priced from Rs. 2.4 Lakhs and above. The ongoing Chevrolet Spark is priced starting Rs. 3.14 Lakhs ex-showroom Delhi which seems quite steep comparing its price with Alto base variant. Below is the picture of Chevrolet Spark ongoing model from same angle which you can clearly see is almost same as the new model spied in Pune, so the chances of changes on the engine, interiors etc. see more likely compared to any striking updates on the exteriors. Also design refresh may make it more desirable car as the Hyundai Eon which is the new 800 CC Segment car from Hyundai India has quite popular because of its looks and features. The interiors of Spark also have a lot of scope for facelift and improvements. Nothing is official about the changes on the new Spark as of now, but the new Spark is expected in second half of the year 2012 as shared by Lowell Paddock in March 2012. We will keep an eye on the developments on 2012 Chevrolet Spark and keep you posted on the same. You can bookmark this page and come back later for updates. You can check out some more Chevrolet India news here.